I love Disney films, usually. They do play fast and loose with their source material though. I still have my doubts that Lion King is based on Hamlet. 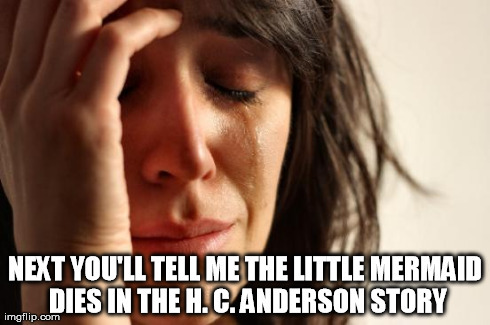 Disney is also the first gateway into a lot of these classical stories. Ask people whom have never read Pinocchio what it is about, and my bet a lot of them could tell the story. It’s about a puppet that is alive, and wants to turn into a real boy. This is the main thread of the film, and this is the basic premise of the book. Everything else, the characters, the tone and the story is very different. With how he finds out he has donkey ears in the book. After he has been at Playland for five months, he wakes one morning and notices he has long ears. You must know that puppets from their birth have very small ears; in fact so small that they are invisible to the naked eyes. So you can imagine how surprised he was when he noticed that his ears had grown so long during the night that they looked like two brooms. He hurried to find a mirror, that he might see himself; but he could not find one. So he filled his wash basin with water, looked into it, and saw what he had been hoping never to see. He saw himself decorated with a magnificent pair of donkey’s ears. Can you imagine poor Pinocchio’s sorrow, shame and despair? Pinocchio was never my favourite Disney-film; I remember I liked it okay. I loved the book. I liked it mostly because of the things that to a lot of people make it grotesque and dark. It’s a dark comedy. He plays the darkness so straight that it becomes absurd and therefore funny. What I mean is that the characters themselves often don’t recognise either the absurdity or the darkness, but the framing in the book does. The book in and of itself knows it is dark and that what the characters are saying often contradict themselves, and therefore the humour is very Meta. We aren’t laughing at what the characters are saying, so much as how they are saying it. One example from a dialog between a farmer and some polecats he has just caught trying to steal food from his farm. The farmer is saying this completely straight. Most people know that taking someone to be killed and eaten is not nice, but that is just the kind of universe this story is set in. That is why I think the book is so funny. Another aspect that I really enjoy is the moral of the book. Not because it’s a bildungsroman, but because it has such a different spin and way of portraying it compared to other bildungsroman in western culture. First, for the people who have no idea what a bildungsroman is. The bildungsroman usually focuses on a main character(s) development from child to grown up. This development isn’t just the physical, but also in regard to moral, actions and relation to his or her self and to the world. It’s not just about growing up, but becoming an adult in all the sense of the word. Taking responsibility. Placing others needs a head of your own. Working hard, even when you don’t want to. To me this book is so effective as bildungsroman because you see the change Pinocchio goes through. 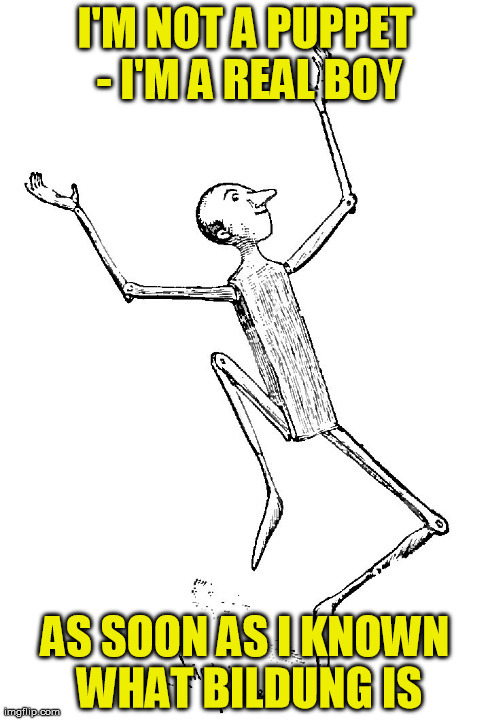 In the Disney film Pinocchio is portrayed as naïve, not evil. Book Pinocchio in the beginning is greedy, selfish and hot tempered. He kills the cricket, not because he is evil, but because he loses his temper and actions have consequences. At these last words Pinocchio lost his temper and, seizing a mallet from the bench, threw it at the cricket. Pinocchio is a real boy, what he is trying to become is a man. 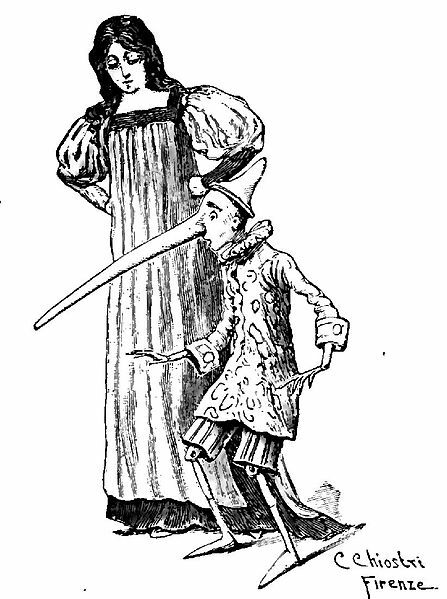 A last correction about the story is that Pinocchio’s nose grows when he is telling lies. Yes, it does grow when telling lies, but also at other times in the story when he is stressed and uncomfortable. Some people think that it takes away from the symbolism of children’s lies shows on the face. I think the book tells children a much better lesson. Lies will not show on your face, which children know because they are very clever. Lies, on the other hand, are uncomfortable and stressing to tell. Thereby teaching children not tell lies because they will get caught, but because they won’t feel right about it if they do. It was growing dark, and Pinocchio remembered that he had eaten nothing all day. There was a painful feeling in his stomach that closely resembled appetite. With boys appetite grows fast. In fact, after a few minutes his appetite became hunger, and in no time he was as hungry as a wolf. His hunger was unbearable.